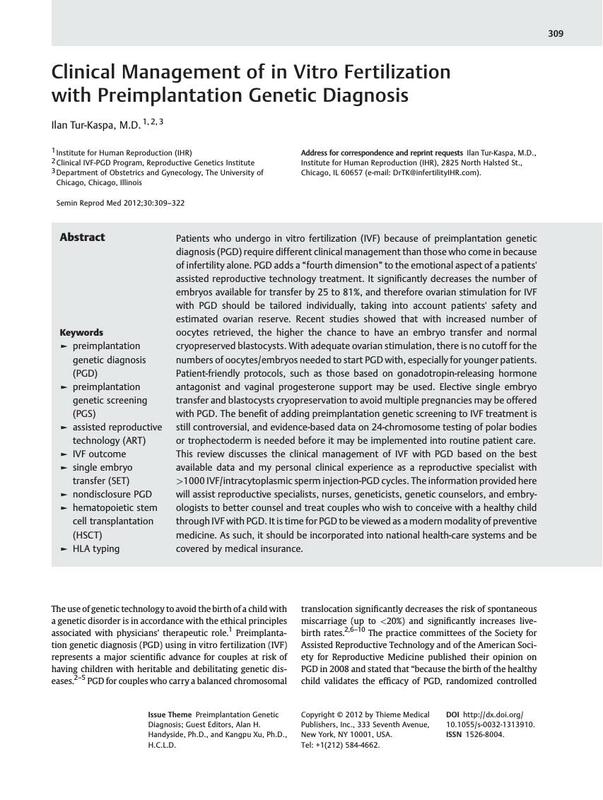 Patients who undergo in vitro fertilization (IVF) because of preimplantation genetic diagnosis (PGD) require different clinical management than those who come in because of infertility alone. PGD adds a “fourth dimension” to the emotional aspect of a patients' assisted reproductive technology treatment. It significantly decreases the number of embryos available for transfer by 25 to 81%, and therefore ovarian stimulation for IVF with PGD should be tailored individually, taking into account patients' safety and estimated ovarian reserve. Recent studies showed that with increased number of oocytes retrieved, the higher the chance to have an embryo transfer and normal cryopreserved blastocysts. With adequate ovarian stimulation, there is no cutoff for the numbers of oocytes/embryos needed to start PGD with, especially for younger patients. Patient-friendly protocols, such as those based on gonadotropin-releasing hormone antagonist and vaginal progesterone support may be used. Elective single embryo transfer and blastocysts cryopreservation to avoid multiple pregnancies may be offered with PGD. The benefit of adding preimplantation genetic screening to IVF treatment is still controversial, and evidence-based data on 24-chromosome testing of polar bodies or trophectoderm is needed before it may be implemented into routine patient care. This review discusses the clinical management of IVF with PGD based on the best available data and my personal clinical experience as a reproductive specialist with >1000 IVF/intracytoplasmic sperm injection-PGD cycles. The information provided here will assist reproductive specialists, nurses, geneticists, genetic counselors, and embryologists to better counsel and treat couples who wish to conceive with a healthy child through IVF with PGD. It is time for PGD to be viewed as a modern modality of preventive medicine. As such, it should be incorporated into national health-care systems and be covered by medical insurance.